OUR FARE IS $10.00 PER PERSON. KIDS UNDER 10 WILL BE $5.00. PAY CASH ON BOAT. FOR THAT $10 FARE, YOU MAY HOP ON AND HOP OFF AS MANY TIMES AS YOU WISH. GROUPS LARGER THAN 6 WILL HAVE A HARD TIME GETTING SEAT AVAILABILITY DURING PEAK SEASON. SEE POLICIES PAGE FOR MORE INFO. YOU ARE ALLOWED TO BRING YOUR OWN DRINKS ON-BOARD. NO GLASS PLEASE. CALL 239-206-0160 BEFORE YOU LEAVE FOR A SERVICE UPDATE. 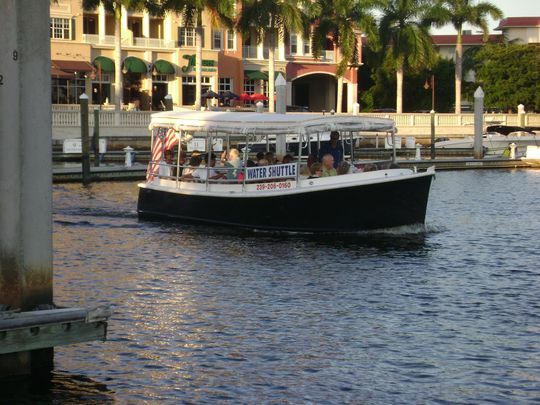 Climb aboard the Naples Bay Water Shuttle! Let us take you on a beautiful, relaxing, and affordable ride to some of Naples' top waterfront shopping, hotel & dining destinations. The shuttle circulates on a fixed route with fixed landings -acting more like a water bus service rather than a water taxi. This service is perfect for visiting our fantastic waterfront restaurants, bars, and hotels. 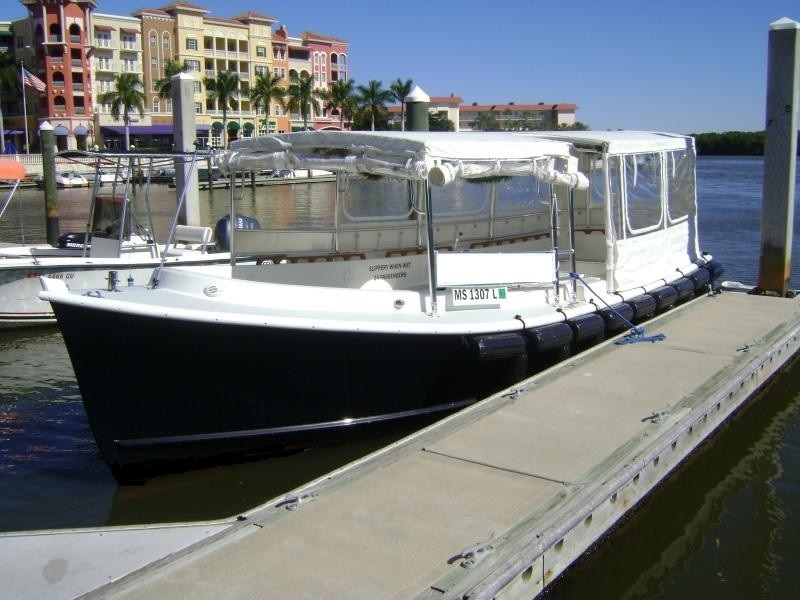 Take a stroll down the docks and check out Naples' finest commercial fleet! If you want to schedule a fishing charter or go out on a sail, this is the place to come. The Wharf Tavern offers an authentic New England style restaurant experience. They specialize in the preparation of Maine lobster, fresh local and nothern fish, prime cuts of meat and poultry and the finest lobster, clams, scallops, shrimp and calamari in the area. This beautiful resort/hotel is home to two popular and highly recommended restaurants; Bonefish Grill & 1500 South (open during winter only). Both are excellent choices! HYATT HOUSE NAPLES - A lovely new 183 room hotel located right on the Gordon River. Beautiful poolside bar on premises. This is Naples' only downtown boutique hotel. Recently refurbished in a Caribbean chic style, this Inn boasts gorgeous waterview rooms and an outdoor patio bar overlooking the Bay! Bayfronts colorful European architecture is an eye catching landmark of Olde Naples. Bayfront is home to Extreme Family Fun....a great place to rent boats, kayaks, and bikes. You may also want to investigate the Segway Tours they run as well! Tavern on the Bay and Shane's Cabana bar are must do's. Also, EJ's serves up the best breakfast in town! Established in 1953, Kelly's is the oldest non-chain restaurant in Naples. Outdoor dining is available with tables out on the functioning dock. The restaurants also has a small bar out on the back dock as well. Naples' original shopping destination. Here you'll find 32 creative boutiques and great restaurants/bars. Originally a 1920's clam shelling and oyster processing plant, Tin City retains the rustic, maritime spirit of what was once the center of Naples' fishing industry. The Riverwalk Restaurant is a great spot to stop! Every guest is this historical landmark is afforded sweeping views of the Bay. Yet the main attraction of this remodeled boathouse is its diverse menu of outstanding cuisine. A waterfront landmark! Enjoy great food and million dollar views in a relaxed casual environment. Year-after-year the Dock is a favorite stop for shuttle riders!